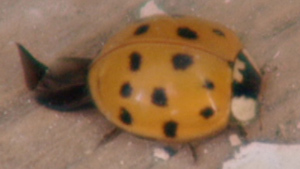 There are reports of swarms of the multicoloured Asian ladybug, an insect known to bite, in Ottawa's southern limits and making their way into more urban areas. Carleton University entomologist Jeff Dawson said in the fall the ladybug looks for places with stable temperatures to survive the winter. Often, they sneak into cracks and open holes in people's homes. The insects also do not face much threat in their natural habitats. "Being an introduced species, they tend not to have the same predators," said Dawson," So their numbers tend to explode at certain times of year." The pretty, yellowish-orange bug has been spotted in the small community of Winchester, Ont., just south of Ottawa, at Carleton University and even at a south Ottawa golf course. Anyone in the Ottawa area? Build this weekend! anyone else thing Ford is biting off Honda?